...I've defeated 657 of those statues. Lagging behind but I'm trudging along. My Fire Crystal job is Beastmaster. The two mystic knights and two monks worked on Liquid Flame. However, I narrowly won and narrowly escaped Karnak castle collapsing. Last playthrough, I easily picked up all the treasure chests before time ran out. This time, I had to forget the last two because I only had a minute left. Made it out with only two people alive. I skipped all but maybe one of the Elixirs. Aero2 was more important to me. Scotty - 1. Monk 2. Mystic Knight 3. Beastmaster 4. ??? I doubt I'll be able to finish by the end of the month, but I have made some headway into the Dimensional Rift. e: I'm away until Friday and I tried to send myself the save file and it didn't work. Boooo. Welp. I figured it was going to be too ambitious of me to try and finish before August ended, what with all the other stuff I'm doing. But I had fun. Yeah, August 31 didn't happen...but I do intend to finish this run! I beat the first two bosses in the Interdimensional Rift with very little problem. We'll see what happens from here. All right fam, I beat Necrophobe and I'm just one Exdeath away from doing this shiz. Will update tomorrow with a more extensive post. Wish me luck. It took quite some doing and a lot of Dualcast Holy, but I managed to do it. When I'm on a desktop computer I'll make my full post with pictures and such. -Bartz was given the Man-Eater instead of the Assassin's Dagger. Some random knife in the rift is better than the Legendary weapon, I guess. 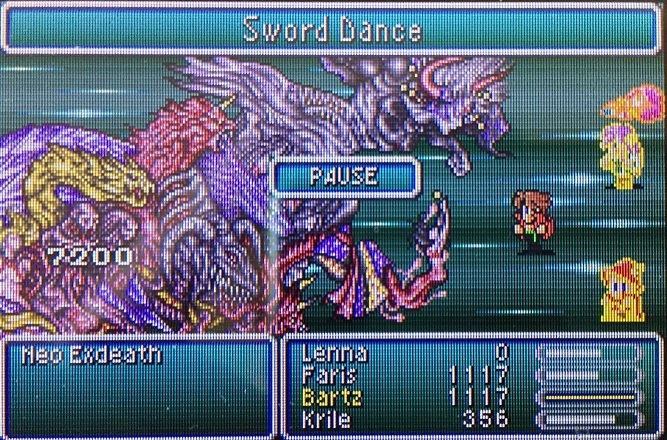 -Bartz was also given Lamia's Tiara, which changes Tempting Tango into Sword Dance. Now he had a 50% chance of Sword Dance as opposed to 25%. This was huge. -Lenna was given the Gold Hairpin and Hermes Sandals. Sometimes she could cast Holy 4 times in a row without anyone else getting a turn. These bosses went by so quickly that I forgot their names. 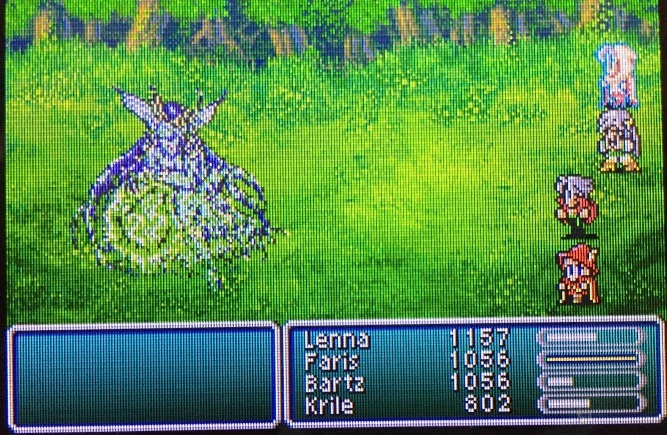 Lenna destroyed them. Fun fact: If you don't get Ramuh earlier in the game, you get him here by chance. I didn't have a Summoner, so naturally I ignored all Summons throughout the game. This kinda surprises me because Ramuh is a pretty weak summon to get this late in the game, but, whatever. Twintania was possibly the hardest challenge I had in the rift, aside from the final boss. Even though he was weak to Holy, it still took 3 or 4 tries to damage race him, because I couldn't defend against his Mega Flare at all. Eventually I made it work, thanks to Holy. Necrophobe was tough because of the Barriers with auto-Reflect. I had to reflect spells off of myself, and I couldn't choose which enemy they would be cast on. It took me a few tries to get Holy to land consistently on one barrier enough to kill it before they all killed me. Once I killed one, though, the rest was cake. 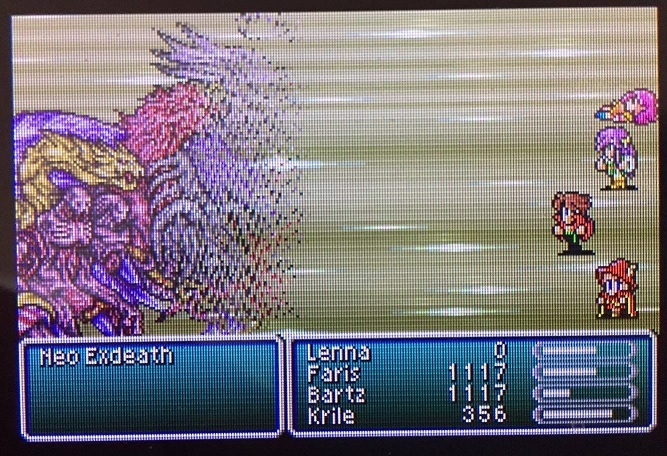 Exdeath Phase 1 was no problem, really. I beat phase 1 at least 6 times. The tricky thing is that I wanted Hero's Rime to percolate long enough to get me at a high enough level to survive Neo Exdeath, and I also wanted to go into Neo Exdeath with everybody packing both Shell and Protect. Exdeath kept landing White Hole, so I had to cast Arise, Esuna, Shell, and Protect on anybody who got hit with it. That slowed me down, but slowing down gave Hero's Rime time to do its thing. Phase 1 was fine. Neo Exdeath...whew. That was tough. Grand Cross was a real problem for me, and Almagest would instakill my whole party if they weren't Shelled. Vacuum Wave would also instakill someone who wasn't Protected. 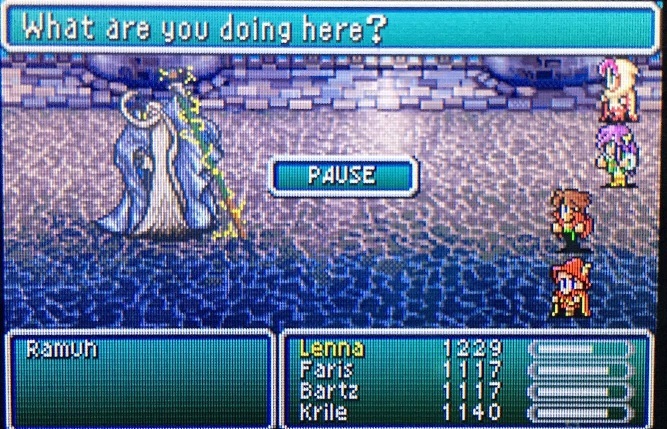 I basically needed everyone to be at full-health and double-buffed the whole time, which would be Krile and Lenna's job...except Lenna was also my main source of damage on Neo Exdeath with Holy. 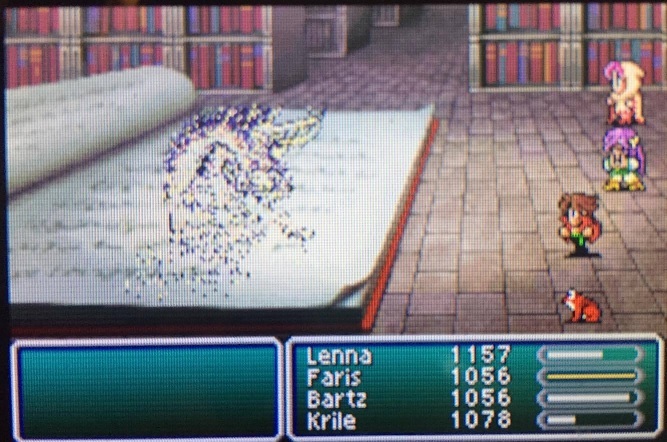 By the time I got to about the middle of the battle, Holy was doing ~7200 damage per spellcast. 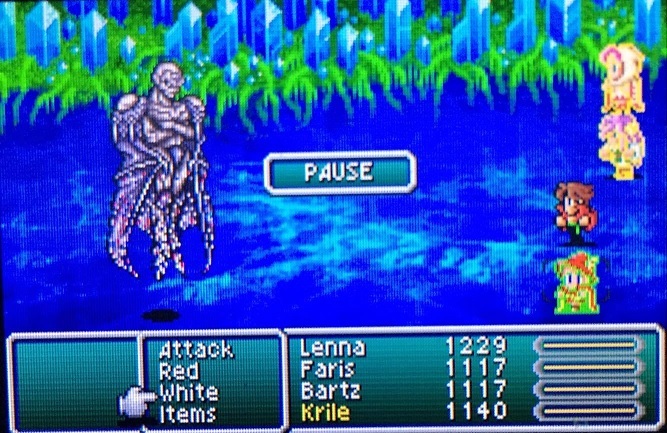 After some very careful juggling of healing, buffing, and Holy, and after a good half-hour of a single boss-fight, I was down to the last target on Neo Exdeath. It started doing Meteor spam. 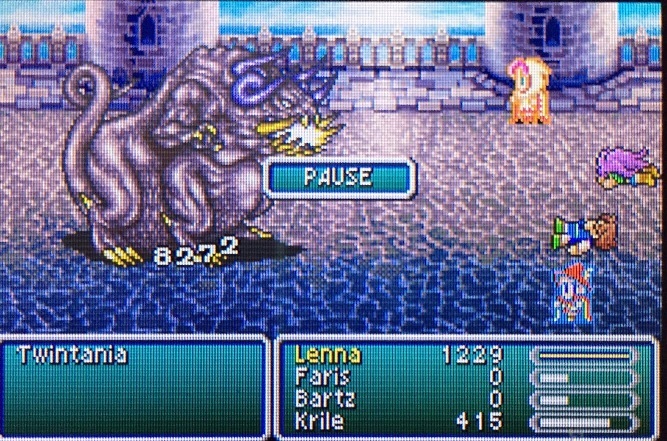 Lenna gets knocked out. I only needed 1 more strong hit to do it. So I go for it. I might have had time for Krile to get her ATB up to cast Holy before he cast Meteor again, but it was a gamble either way. Thankfully, I rolled Swords Dance. Thankfully, it was all I needed. Four Job Fiesta complete. This was awesome, so I'll give a huge shoutout to @Valigarmander for the idea. 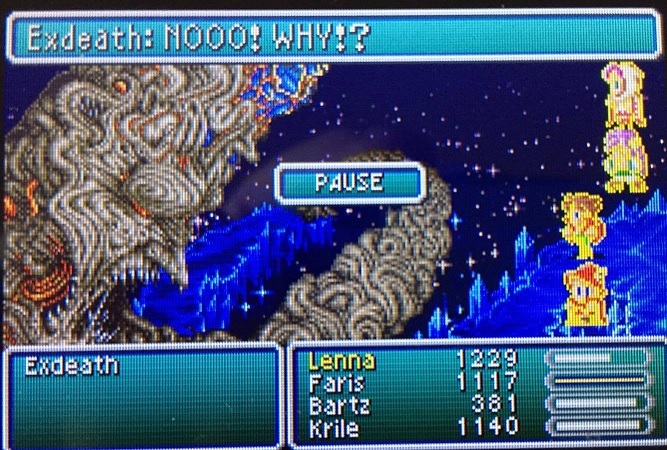 FFV has shot up my list of favorite JRPG's because of this run. It's amazing that the game is so well-balanced that any combination of 4 jobs can beat the game like this. There really are no bad jobs in this game--even though I was disappointed in Red Mage, Bard, and Dancer...they really came through in the clutch. Without DualCast, I wouldn't have gotten very far in the dimensional rift. Without Hero's Rime, I would have had to grind for several more hours before being at a suitable level to beat the game. Without Swords Dance, I wouldn't have had any physical damage to speak of--even if it was unreliable, that just made things more exciting. That final Swords Dance to beat the game speaks volumes--I was so excited, I'm surprised I didn't break my DS Lite right then and there. This game is fantastic. This run was fun. Wish I would have made my self-imposed deadline, but I'm just glad I did it at all! Maybe I'll buy the Breath of the Wild DLC now. I'm sorta stuck in the castle at the end of World 2 and don't really have a good way to grind... Hmm. If you're using an emulator, you could use a save state editor and give all of your party members 999,999,999 experience. Are you stuck on regular enemies, Kat, or on Exdeath specifically? If it's any consolation, the dragons are definitely the hardest things at that point in the game. If you can run from them, you still might be able to power through the dungeon and beat Exdeath and get yourself to a better place to grind.